Pollock, Mondrian and Matisse organized into a straight line. 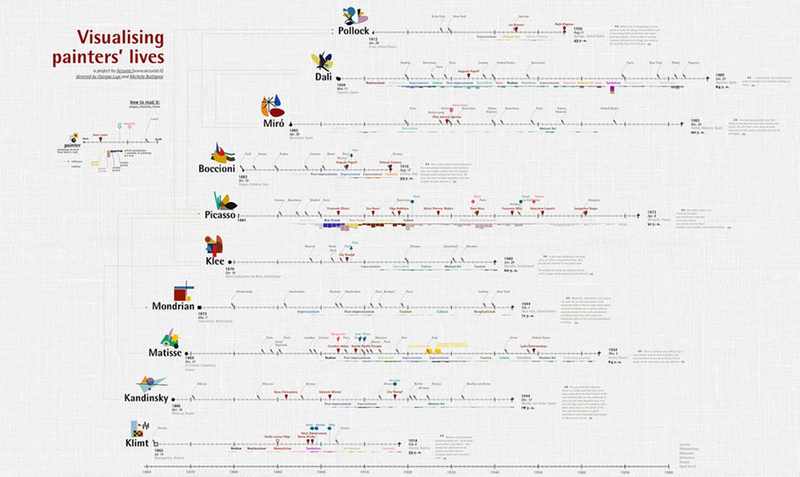 This next level infographic presents a fresh way to look at art history. Created by Italian-American design firm Accurat, these visual narratives recreate the lives of Picasso, Miró, Mondrian, Klee, Boccioni, Kandinsky, Klimt, Dali, Matisse and Pollock. Each painter’s timeline illustrates his artistic production, awards, connections, influences, health, habits, love affairs and geography. The infographics are packed with information including exhibitions, marriages and astrological sign. Interestingly, as pointed about by this Fast Company article, the web of connections between the artists hinge on Picasso and Paris. Giorgia Lupi also points out that Mondrian was the only painter without any reported love affairs. Watch Accurat’s video about the series below and check out their Flickr to see the individual infographics up close. Studio Beat is about artists and their spaces.